New and improved 2.0 version. The AMP60 is a great compact amp for smaller applications, such as driving a couple of small speakers for your computer or adding a separate zone for your whole house system. 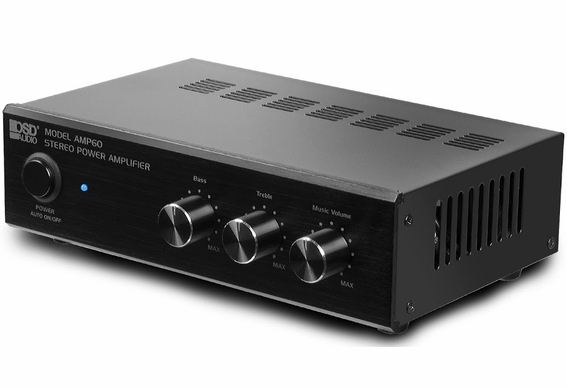 The AMP60 has an output of 25 watts per channel and uses an analog chip amplifier intended for simple applications. Customers often purchase the AMP60 to play their iPod or other portable device through bookshelf speakers located in the bedroom or den. Connecting the AMP60 to an iPod is easy. 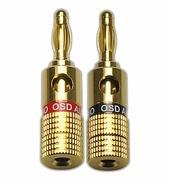 Simply purchase our inexpensive RCA-to-mini cable adapter (located under the AV Cable tab), connect the RCA inputs to the back of the AMP60 and the mini plug to the headphone jack of your iPod. Note: When it comes to amplification, it's important to choose the right model for the job. If you want to power two pairs of speakers, we recommend stepping up to the AMP120. If you're looking for a high current amp that can handle more complex installations, take a look at our AMP200 or AMP300. Note: This amp is designed for smaller applications and will only power a pair of small speakers. Also note that it is recommended you use speakers with no more then 120 watts peak (60 watts RMS). 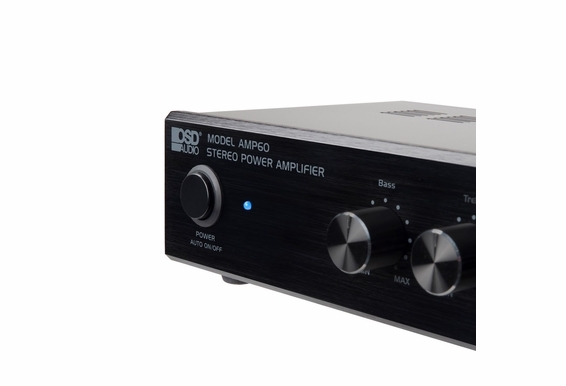 A favorite of audiophiles everywhere, the OSD Amp60 two-channel power amplifier is built to deliver powerful music, pure and simple, with few extra controls to get in the way. 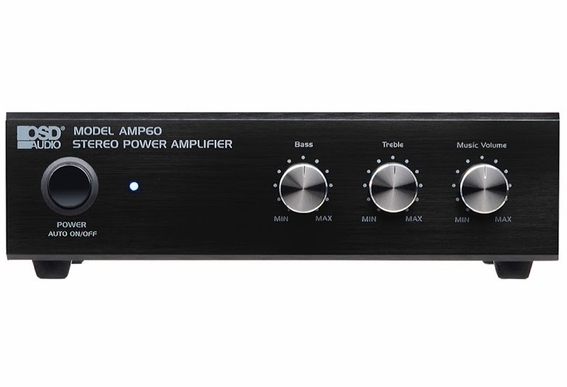 Listeners can use the Amp60 as an independent stereo amp (25 watts x 2 into 8 ohms) when used with a preamp, as a second zone amplifier in multi-room applications. The amp boasts a precise frequency response of 20 Hz to 20 kHz and total harmonic distortion of 0.02 percent. 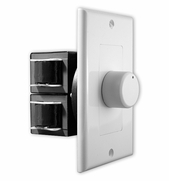 Additional features include dual speaker outputs and dual inputs, front-panel mounted volume and balance knobs. All OSD amps are backed by a two-year warranty on parts and labor. Could I use this to run a seperate set of speakers out from my television? Just in a workout room that I would like to have a set of speakers for the tv and maybe to run an ipod. Is this one of those "T" amps made in China? Thanks. can I plug in my cassette deck? Will this power a single pair of ICE600WRS speakers? Hello, I have a couple of questions about the AMP60. I've tried looking at your online manual and have not found the answers. The power button: the specs state that it is auto on/off. Is it possible to override the auto on (manually switch it to on and stay that way until you turn it off) or is it only automatic on/off? 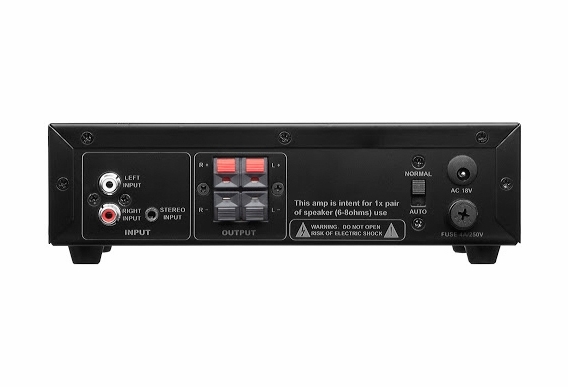 Also, since there are two sets of speaker outputs, but no speaker switch, are the second speaker outputs for connecting to a powered subwoofer's high level inputs or something? How does this sound in comparison to commonly available class-d amplifiers (Topping, SMSL, etc.)? What is a guess as to how much power this amplifier would consume in normal operation with 8 ohm speakers at normal listening volumes? Thanks for the information! -Kent W.
does it have ce, rohs, or any other certification ? The images and manual show two inputs, a RCA line in and a mini-plug input. I would like to use the RCA input normally, but can envision occasionally using the plug-based input (e.g. temporarily connecting friends ipods, etc.). How are these inputs switched? What happens when the amp sees signal on both (which takes priority)? Can I use both? Does the amp work with the european 230V power standard? Is the 18vac power supply included with the amp? The main picture shows connections for a single pair of speakers and the unit itself states the same on the back panel. However, the PDF manual shows connection for two pairs of speakers and states specifically that "more than one pair of speakers can be used." Seems two slightly different amps are being shown. Which is correct? Also, are the physical dimension measurements in the manual still accurate? Thanks. Hi--I purchased a pair of AP670 patio speakers a few weeks ago, and now I'm thinking about running them with a dedicated amplifier instead of the one I also use for indoor speakers. Would the AMP60 amplifier be sufficient? Hi Kevin, The AMP60 only puts out 25w per channel, so that would be a little under powered for those speakers. I would recommend the AMP120! Can I install this amp in an attic in Texas. Hi Jesse, Usually want to have the amp in a semi-cool location. As long as the basement doesn't get too hot, that should be doable. I have a pair of rock speakers that are 8 ohms and 100 watts - would this be a good unit to use with them or would it be underpowered? Hi Tom, What size are the woofers? Are talking 100 watts RMS or max? If max, then the AMP60 would be okay to use. If RMS, then you probably want to use something like our AMP120. Really it depends on how you'll be using them. If it's for background music, you don't need much power. If you want to turn them up and have decent bass response, you want more power to drive the speakers. I am using a 7.1 home theater receiver in the main room while running 2 outdoor speaker from the B channel. The inside is always louder that the outside. I'm trying to determine a good way to increase volume of the B channel to allow for a similar volume inside and out. How? Can I run the B channel output into the input of the amp in order to utilize the volume and tone controls of the AMP60? Hi Randy, You have the right idea, but I don't know if the AMP60 will give you the extra power you want. I'd recommend the AMP120. I need an amplifier like this that can power two small outdoor speakers that also has a subwoofer line out for a powered sub. Any suggestions? I need a back yard amplifier, maybe 25W per channel; or so, and would prefer Bluetooth capability so I do not have to connect our iPhones directly to the unit. I already have some speakers. Hello Rich, Our only outdoor rated amplifier/receiver is the MA2, but it is not Bluetooth. What you can do is simply use our Bluetooth outdoor speakers which are self-amplified. Check out the BTR800 or BTP650. Thanks! Hi, can I use the amp 60 to power 2 pairs of ice810 ceiling speakers Thanks. 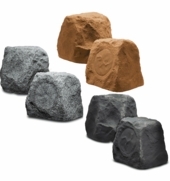 I need an amp to drive a pair of outdoor 'rock' speakers. I believe the speakers are 8 ohms but don't think they can handle a lot of power. I've plugged them into the 'B' speaker channel on my home theatre amp and they will sometimes shut off if the volume is turned up too much. The existing speaker wire is pretty thin, so I also plan to upgrade to 14 or 16 gauge speaker wire for this application. Would this unit suffice or should I go one step up ? I am using this amp to run a pair of speakers in my garage. When I hook up my phone to the 3.5mm audio jack it will play for a while and then cut off. I have to power off the amp and then back on to get sound. Any thoughts? 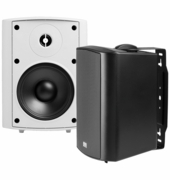 I currently have a pair of the TIC GS5 inground speakers that are powered by a lepai 2020+ which is supposed to be 2x20RMS. Volume and sound wise the setup is great. However, I want to add a pair of speakers in the patio area that will mount to the patio ceiling and need to change amplifier to something that can run both pair of speakers. I currently use 2 sources, TV and play music from my phone via a HomeSpot NFC Bluetooth receiver that plugs into the amplifier via the 3.5mm jack., TV is through RCA jacks. Will the AMP60 be able to handle this using my current TIC GS5 speakers and adding in a pair of your patio speakers? The TIC speakers are located behind and to the sides of a spa, which makes it hard to hear when sitting in the spa and it is running, so looking for patio speakers I can mount to the front to get sound coming from that direction when sitting in the spa. Will this run a pair of Sony SS-F7000 floorstanding speakers? Was considering the AMP120, but I really like the idea of tone controls, so I can avoid having to run an EQ from my turntable/phono preamp. 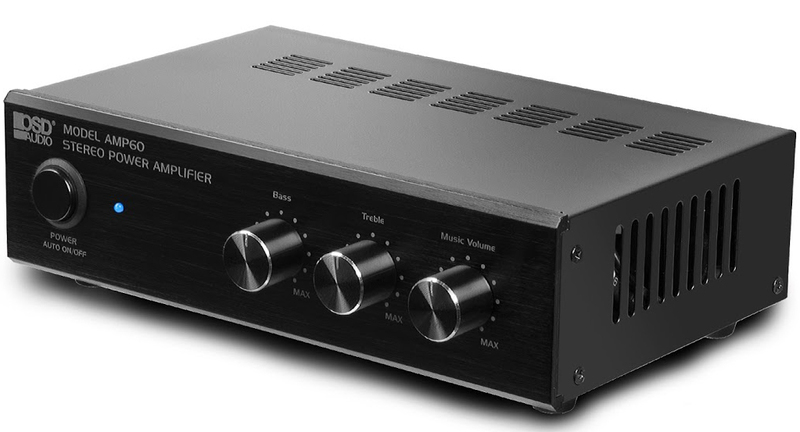 I just bought two of these amplifiers to power 6 Sony bookshelf speakers, ever now and then the amps will cut out and i will have to eaither unplug and plug the jack in or turn off and then on again. Am i doing something wrong? Hello, a few questions. 1.) Looking to power two 100w Max / 50rms Insignia In-ceiling speakers. Would this be enough to do the job? I'm confused as to the power ratings of the amp, is it 25watts MAX per channel or 25watts RMS per channel? Lastly, seeing that the device has no input switching will the "stereo-in" and the RCA Left/Right be combined if they're both hooked up simultaneously? Thanks! I will be ordering the AP490 patio speakers. Will this amp work with these speakers? I have a pioneer VSX-1017TXV-K receiver. I am planning to use this amp in india. Does it work with 220v power input. If not do you have any converter? What is the lower end of the frequency range? I wish to drive a few coils from 2-20 Hz for a physics demo. Will the AMP60 be the correct amp to power Klipsch KHO-7 outdoor speakers? The power handling is 75 watt max continuous and a 300 watt peak. The impedance is 8 ohm. I plan on using only one pair of speakers. The run is approximately 30 to 50 feet from the source. 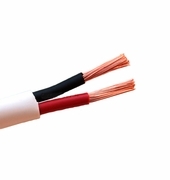 Also what gauge of speaker wire should be used with my set up? Is this amp identical to the AudioSource AMP-50 amp? I'm thinking of buying this and am just wondering if it will power 4 small speakers i have in 1 room. I want my TV sound to go into the amp, then to the speakers. Any idea if this will work for that? I'm thinking about getting 4 speakers for my backyard. Would this AMP60 be sufficient? Thanks! 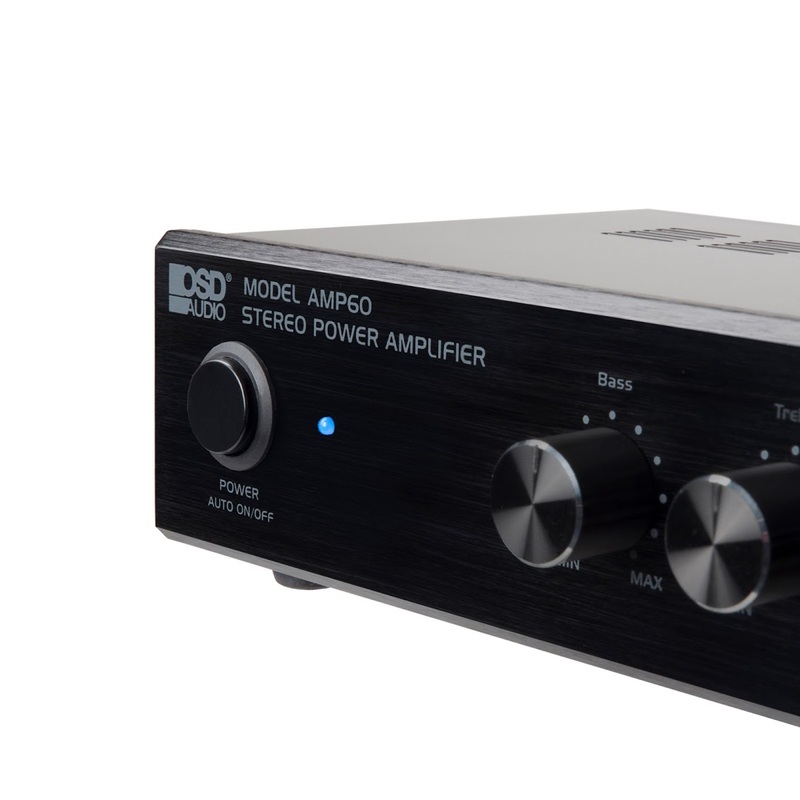 Can I plug an iPod into the OSD Audio AMP60 Amplifier (will it run on 220V? ), which feeds to an OSD SSV@ Automatic Impedance Matching Speaker Selector, and power 6 small, 4 or 8 ohm outdoor "fake rock speakers"? They don't have to play loudly, just ambient sound spread evenly along a 30 ft terrace wall. And who can tell me the best way to link the speakers! It the item description, it warns about using this amp for no more than two pairs of speakers. Would I have enough power if I ran this through your ISS4 to three zones, each running a pair of 8 ohm KLH indoor/outdoor speakers and each having a seperate resistor-based volume control? I assume the AMP120 is better? What kind of power is to be supplied? The specs say nothing about that. The photo of the rear shows a connector with legend "AC 18 V". The connector looks however like the small-appliance mains connector. Starting from 220V 50Hz I have, what would I need? Why does this amp get so hot and the left channel cuts out, then back on over and over again untill you turn it off, let it cool, then back on. I only play soft music on my back patio and never have the volume up past 4. Would this amp sufficiency power these speakers? : https://goo.gl/O7dmH Thanks. I want to take it with me when I travel. how much does it weigh? I purchased this amp in the summer of 2011. I have it in an outdoor cabinet under my patio. When in operation, the cabinet is open. I have experienced a channel dropping after about 30 minutes of use. I think this is a result of heat. Is this something that happens and what can I do to correct it? I am looking for a compact amp to drive two outside speakers, and this seems to fit the bill exactly. But I also need a remote to control on/off and volume. Can you suggest a similar model that also comes with a remote? Hello, I would like to know if this Amp can power well my 4 external speakers( each speaker has 100 w max and 8 omns). Thank you! Regarding the dual inputs, does it have priority switching or something like that?